All marine satellite antennas comprise a parbolic dish, housed in a radome, and stabilized against movement of the vessel. The LNB receives the signal from the satellite and sends it down to the multiswitch or directly to the receiver. The LNB converter amplifies the very weak signal that is received by the antenna from the satellite which is 22300 miles above the earth, and converts it from the high band Ku or Ka frequencies down to L-Band (1.5GHz) which is easier to transport on ordinary cables from the antenna down to the decoder below decks. Without the function of the LNB we would need to run waveguide or very high tech cable between the antenna and receiver below. It is called Low Noise because the signal it receives is weak and high in frequency and it is critical that the amplification and down converting process introduce as little noise to the signal as possible. It is called a Block converter as it converts the entire block of frequencies (all transponders) that it receives in that polarization or band down to the intermediate L-Band frequency. In order to convert the received signals, the LNB uses a superheterodyne principle, like the old AM radios, to mix the incoming signal with the frequency of a local oscillator (L.O.). The result of this mixing, is the sum and difference of the two frequencies. So if you receive a frequency of say 11539 MHz from the satellite, and mix it with a local oscillator LO of 10500 MHz the resultant sum and difference frequencies are 1039 MHz (and also 22039 MHz which we don't care about, and it is filtered out). So now we have a frequency of 1039 MHz containing all the information we need to generate our TV picture. Many TV LNBs (especially the ones used in Europe) have dual oscillators, allowing you to receive a high band (LO=10600 MHz) and a low band signal (LO=9750 MHz) on separate coaxial outlets. It is important to have the correct LNB LO frequency for the satellite that you intend to use: European 9750/10600, DTV Caribbean 10500 and USA/Canada 11250. Satellite TV in the Americas uses circular polarization. Instead of transmitting the signal in a vertical or horizontal plane, they somehow manage to send the signal out in a spiral pattern, separating the signals in a left hand spiral or a right hand spiral. This allows them to reuse the same frequencies on the both the Left Hand Circular Pol (LHCP) and the Right Hand Circular Pol (RHCP) on the same satellite, resulting in twice the number of channels. Like linear polarization, they can transmit two signals, on the same frequency, with one transmitted in a clockwise spiral, or Left Hand Circular Polarization (LHCP) and the other transmitted in a counterclockwise or Right Hand Circular Polarization (RHCP) this doubling the capacity of the satellite. The advantage of circular polarization is that you do not need to align the LNB with the satellite. Most US/Canada and Caribbean (Latin America) LNBs use LHCP and RHCP connecting on two ports on the LNB. The POL that the port puts out is controlled by the supply voltage to the port. 12/13 Volts DC supply to either port will produce RHCP signals and 18V to either port will produce LHCP signals. It does not matter which port you connect to. Both ports are capable of either pol, selected by the 13V or 18 V supply. With a SeaTel installation one uses the Blue and White connectors which are the low band connectors. If you only have two TV decoders, you can connect one decoder to each port without the need for a multi-switch. Each decoder will switch the voltage to the LNB for the required polarization signal. In order to re-use the same frequency for more than one signal, the satellites employ different polarization techniques. With linear polarization, the satellite can transmit one signal at a frequency of , say 11592 MHz, in the horizontal plane and then transmit another signal at the the same frequency in the vertical plane and this doubles the capacity of the satellite. Typically a satellite will transmit about 36 transponders of vertical signals, and 36 transponders of horizontal signals, sometimes at exactly the same frequencies, and sometimes staggered so that the horizontal transponders fall between the vertical providing further isolation. At the receiving antenna the feed and LNB are able to distinguish between the horizontal and vertical signals. There is typically more than 30 dBs of isolation between a horizontal and vertical signal, so the two will not interfere with each other when they arrive at the antenna. The European satellite TV signals use a combination of Linear Polarization as well as High and Low band. This results in 4 output coaxial signals from the LNB. Vertical Low, Horizontal Low, Vertical High and Horizontal High, often abbreviated to VL, HL, VH, HH or V/L, H/L, V/H, H/H. Unlike the American LNBs each port is dedicated to a particular band and POL, so it is important that the correct cable is connected to the correct output from the LNB. 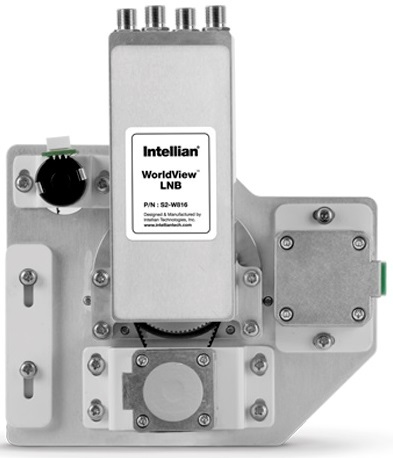 It is also important that the European linear LNB is correctly aligned with the satellite in order to receive both the horizontal and vertical signals at the maximum strength. When installing a European LNB, it is important to align the horizontal and vertical planes with the satellite. (The Americas LNBs use circular polarization, so alignment is not necessary). To line up the European LNB, set your antenna controller satellite longitude to the same as the ship's longitude. For example, if the ship is at longitude 8 degrees East, set your satellite longitude to SAT 8E even though there may not be any satellite at that longitude. Then go to the antenna and install the LNB so that it is vertical, with the 4 coax connections coming out of the top or, in some antennas, the bottom. On a SeaTel antenna, connect the White to the H/L, Blue to the V/L, Green to the V/H and Black to the H/H. Now, when you target your required satellite (example SAT 28.2E) the antenna will rotate the feed and LNB to the correct POL angle for that satellite. 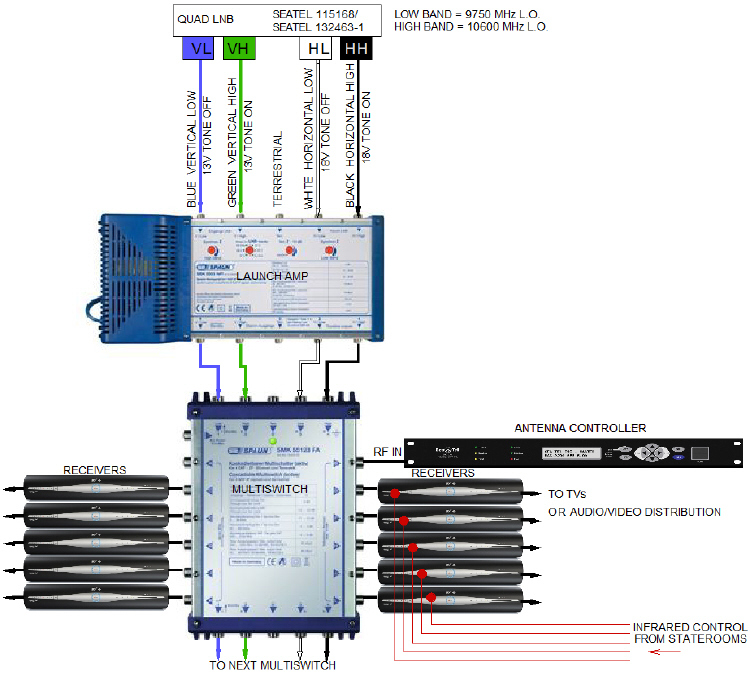 The multiswitch connects many decoders/receivers to a single LNB. Each decoder puts out a signal to the multiswitch to determine which band and which POL is required for the TV channel that has been selected by the viewer. A DC voltage of 13V on the coax indicates that it requires a vertical POL signal, and 18V indicates a Horizontal POL signal. The presence of a 22 KHz tone on the coax indicates that it requires the high band and the absence of the 22 KHz tone indicates the low band. In the case of a European LNB for example, the decoder will put out 18V DC on the coax without any tone, when it requires the Horizontal Low band, and the multiswitch will connect that receiver to the 3rd coax going up to the white connector on the LNB. If the same decoder requires Horizontal High band it will put out 18V as well as the 22KHz tone and the multiswitch will connect the decoder to the 4th coax going up to the black connector on the LNB. The same applies to vertical low and high bands. The European LNB does not care what voltage it receives. It always puts out the same signal on the same coax. Thye switching is done in the multiswitch below. Above the multiswitch, each port puts out the same pol and band continuously on the same coax. The tone and voltage signals are used only below the multiswitch to signal the multiswitch which coax to select. In the Americas only the first, RHCP(V/L)and third, LHCP(H/L) coaxes are used. 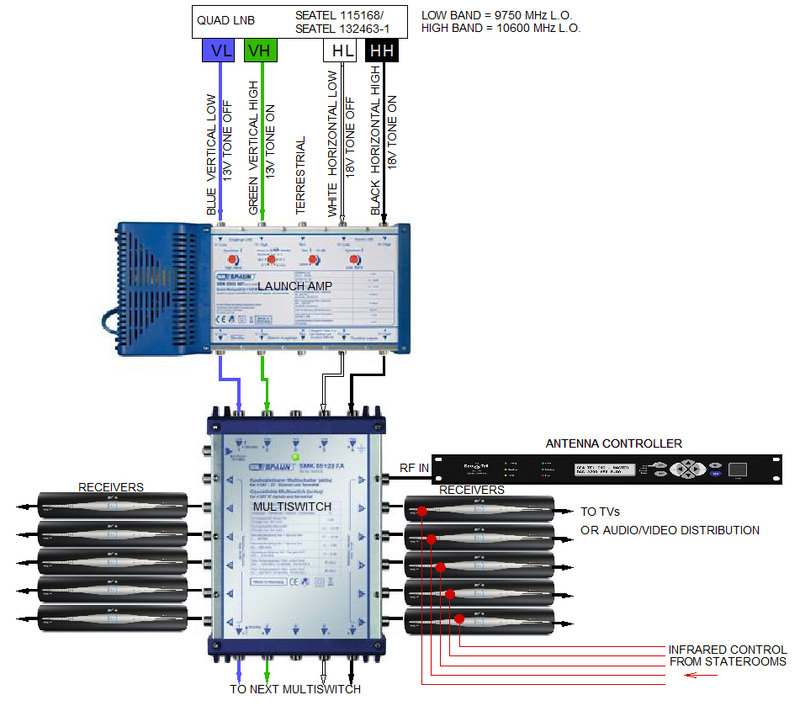 When the DirecTV decoder ( for example) puts out 12 (or 13)Volts on the coax, the multiswitch will connect that decoder to the first coax and also supply the LNB with 12V DC to get a RHCP signal. If the decoder puts out 18V DC on the coax , the multiswitch will connect that decoder to the third coax, LHCP(H/L) and provide 18V to request a LHCP signal from the LNB. Unlike the European LNB where each LNB port is dedicated to a band and pol, the American LNBs require 12V for RHCP and 18V for LHCP on either port. The multiswitch will always supply 12V on the first coax RHCP and 18V on the third coax LHCP to the LNB. With the Europe LNB, it is very important that each cable from the multiswitch connects to the correct LNB port VL, HL, VH, HH. Mixed up cables and incorrect labeling is one of the most common problems when transitioning from US/Caribbean waters resulting in loss of half the transponders. To overcome blockage by the mast, some yachts have two antennas, one on each side of the mast, to port and starboard. 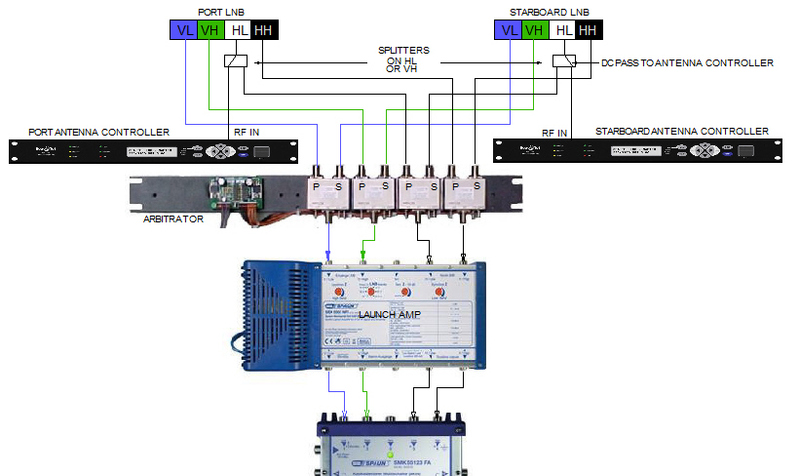 The blockage zones set in each antenna controller determine when the arbitrator coax relays will switch from the blocked antenna to the antenna with clear sight of the satellite. Since each antenna needs to track it's own signal, each antenna controller needs to get it's tracking signal from a splitter on one of the LNB coaxes above the arbitrator. In most cases the splitter has one side that passes a DC signal, and the other side blocks the 18/13 Volt DC signal that is used to signal the LNB for LHCP or RHCP polarizations. The DC PASS side of the splitter must go to the antenna controller so that the DAC will continue to track and supply voltage to the LNB even when the arbitrator has switched to the other antenna. With a dual antenna in Caribbean or US waters, with a circular LNB, it is essential that the DAC is set to the correct VOLT setting. If the splitter is on the HORIZONTAL LOW coax, then the VOLT must be set to LHCP or 18 Volts. If the wrong setting is entered in the DAC, it could result in loss of channels from that particular polarization. I have flown many miles, at great expense to the customer, simply to change a setting in the DAC from RCHP to LHCP to restore signal to half their channels. The RHCP/VERT 13V signal from the DAC to the LNB was conflicting with the required 18V/LHCP/HORZ from the mulltiswitch. This is not an issue with single antenna installations, as the DAC connects to a subscriber port below the multiswitch. It is also not an issue in Europe, as the Europe LNB is not dependant on the correct voltage applied The HL low port always puts out HL irrespective of the voltage. In the US and Caribbean, each port of the LNB can put out either LHCP (18V) or RHCP(13V), depending on the voltage applied, so it is important that if the multiswitch is sending 13 V RHCP on the VL coax, then the DAC must send 18V LHCP on the HL coax. In the US and Caribbean, where only the blue (VL) and white (HL) coaxes are used for low band signals, the tracking signal is split off the horizontal low (White) coax above the arbitrator. The official, SeaTel, dual antenna diagram shows the signal split off the vertical high (green) coax, and many yachts originating in Europe are configured this way. Vertical high in Europe does give more tracking choices, but this requires moving the splitter back and forth between coaxes, as the vessel moves across the Atlantic. It is preferable to keep the tracking signal on the Horizontal Low coax to avoid having to get behind the rack at the start of each season to move the cables and splitters. There are good horizontal low tracking options in the Mediterranean. Most decoders come in the form of a set top box, with a remote control. It will have a Satellite input from the LNB or multi-switch, and composite video out (yellow) and Stereo audio out (red and white). Many boxes come with HDMI and S-Video outputs as well. Some have an input for your terrestrial antenna or cable. Some have USB inputs that allow control of the receiver by an external remote system like Crestron. Most are equipped with an infrared eye to receive commands from the remote control or Crestron. IR Extenders and Blink LED emitters. In some cases you might want to hide the receiver in a cupboard or locate it with other receivers close to the head end. For this you would need an IR extender, which consists of a receiver that is mounted discreetly near the TV, which receives the commands from the remote control, and transmits them over wire to the IR emitter that is attached to the sensor on the front of the receiver which is hidden away in a closet or located a few decks away in another space. When locating several receivers together, it is important to black out the IR emitter with a patch provided by the manufacturer, or black electrical tape. This is to prevent commands from one receiver bleeding over to another. In some cases, installers prefer to use "naked" emitters that fit inside the receiver and come out on a jack plug on the rear panel. 124088 visits to this page since 28 Nov 2012.